In the mid-2010s multilateralism centered on East Asia stands at a turning point. What are its main purposes? What balance of power—military, economic, and cultural—will it reflect? Who will lead? The questions are never-ending at a time of extraordinary flux. ASEAN seeks to sustain its leadership. China is pressing for a region centered on its role as the driving force economically with other aspects of leadership to follow. The United States has reasserted its claim to leadership militarily while rebalancing in other aspects of leadership as well. Other great powers have their own designs on regional architecture, including Russia, India, and Japan. Middle powers—notably Australia, South Korea, and Indonesia—are not as bold, but their thinking figures into the overall mix. Some perceive increased complexity with so many actors involved. Others detect signs of polarization as China and the United States become increasingly adversarial in their regional strategies. Whether one focuses on multilateralism as a broad concept of cooperation in inter-state relations, regionalism as a narrower theme usually of a higher order with clearer imprint of geographical propinquity, or community as a concept showcasing deeper interaction, awareness of the way countries are pursuing these goals has risen appreciably. During the time of the Cold War, it was assumed that the United States and Soviet Union were each keen on extending their blocs, as evidenced by the Korean War and Vietnam War. From the 1960s there was awareness of China’s aspirations for an Asian “revolutionary bloc” at odds with the Soviet “revisionist bloc,” and of Japan’s aspirations for “reentry into Asia” initially through a “flying geese formation” distinctive from the US presence in Asia. In the waning days of the Cold War, the two-bloc paradigm and efforts to add new patterns without breaking free of it were drawing to an end. For a time, it appeared that China and Japan were accepting a single integrative framework just as the Soviet Union was losing its competitive force, but they would instead intensify their pursuit of multilateralism as new opportunities were being created, economically, militarily, and culturally. China has abandoned “revolution” and Japan has been deserted by the “flying geese,” but their aims began to clash again from the 1990s, while other actors joined the fray against a backdrop of relative decline in the US capacity to keep its grip on developments across the region. Over more than two decades since the end of the Cold War, we can observe four periods of triumphalist pursuit of leadership in multilateralism. The first claimant was Japan in the brief period when the collapse of its bubble economy had not fully registered, while optimism over becoming a bridge between China and the United States was surging. If it had championed APEC offering reassurance about Asia-Pacific economic integration and had hesitated to back Mahathir’s East Asian Economic Caucus (EAEC) as provocative to the United States, Japan’s expectations for regional leadership remained strong during the 1990s, even reviving with its abortive proposal for an Asian Monetary Fund in 1997. The second claimant was the United States, enamored of such ideas as: financial globalization was unstoppable after “Asian values” had been discredited in the Asian financial crisis of 1997-1998, APEC could be strengthened, US alliances could be reinvigorated, and there would be no barrier to universal values reigning supreme without danger from exclusive regionalism in East Asia. Yet, establishment of ASEAN+3 and ASEAN’s increasingly central role in planning aiming at regionalism or even an East Asian community made apparent through the first half of 2000s that ASEAN had emerged as the latest claimant. However, much of it appeared to be a residual choice, doubt that any one power could assert leadership gave it the opportunity. Yet, at the end of the decade, China’s rise had given it sufficient confidence to press for leadership no longer deferential to ASEAN. It sought to be the economic nexus, to limit the US alliance and defense partnership networks, and to pursue a new cultural compact separate from universal values. China’s moves resulted in a backlash that kept gathering steam in the first half of the 2010s, but its aspirations were not lowered, as the three other claimants reinvigorated their efforts and other states made their own multilateral preferences clear too. The battle over multilateralism was joined. Jochen Prantl’s article warns that the study of multilateralism has been troubled by the concepts and theories it has drawn from Western experience and a warped view of the processes involved, while suggesting that East Asia is a treasure trove for the study of the subject because it refutes mainstream thinking. His purpose is to help develop analytical concepts, especially for what he calls the scope conditions that guide multilateralism in East Asia and for what he labels the pathways to study multilateralism in this region. He concludes with five principles that may serve as signposts for creating a new regional security order, prioritizing this factor in trying to understand multilateralism’s prospects. While Evelyn Goh shares Prantl’s concern about great power relations, pointing to what she calls a “bargain deficit” among them, she focuses on ASEAN-led multilateralism and the extent to which it leads to regional order. She finds that countries subscribe to its leadership for instrumental reasons, which makes it less effective in mediating conflicts of interest than expected. This means that security is largely determined by great power politics, and that an approach of enmeshing these powers in multilateral institutions, as ASEAN has done, is becoming outdated. Goh stresses the limits of multilateralism as channels of action that fall short of regionalism, adding that these channels have become ends in themselves rather than the means to achieve a sustainable regional order. Listing both achievements and limitations of ASEAN’s efforts, she concludes with arguments in favor of ASEAN doing more to establish “rules of the road” while also acknowledging that it cannot do much to mediate—the powers must strike their own strategic bargains. Zhang Xiaotong and Li Xiaoyue assess Chinese thinking about multilateralism, arguing that Xi Jinping is pressing for a new type of regionalism, grounded in infrastructure links and redolent with historical and cultural linkages. Since the 1990s, it has focused on trade and other economic ties as the crux of regionalism, but lately China has been adding what can be called community-building ties. Xi’s proposed “community of common destiny,” seeding “community consciousness in neighboring countries.” Recently, Xi has proposed combining “morality” and “interest.” The article concludes with eight characteristics of regionalism with Chinese characteristics, including building a regional identity as part of an Asian community and looking back to history and civilizational themes for soft power. Although some points are not specified clearly, there seems to be a contradiction between the open regionalism and low-key reassurances they mention and an exclusive notion of China as the wellspring of Asian civilization and the generator of a new regional identity. Apart from tightening strategic cooperation between China and Russia, ambivalent as it appears at times, China has stirred a wide-ranging strategic backlash. Although South Korea is cautious about expressing its concerns, given China’s vital role in North Korea, and some states in Southeast Asia and Central Asia consider prudence to be the better part of valor, the backlash reaches from Northeast Asia to South Asia, encompassing the better part of maritime Southeast Asia. Three states with hot, ongoing territorial disputes are in the forefront—Japan, the Philippines, and Vietnam—and the United States stands squarely in the background. As China’s military build-up continues at a rapid clip, there is no reason to foresee any reversal to the trend of recent years. It is unlikely that NATO of the East will materialize; but something more than a hub-and-spokes pattern is taking shape. Japan, Australia, and India are all forging closer military ties, while the front-line states of Southeast Asia are intensifying linkages with partners other than the United States, even Russia—although its continued ability to straddle China and states fearful of China is in doubt. South Korea has tried to limit its US alliance ties to facing North Korea even as US pressure has grown to expand ballistic missile defense cooperation and other forms of bilateral and trilateral coordination with Japan, which China sees as against it. Some observers recognize that strategic multilateralism is tilting further toward a US-centered system, but doubt the spillover to economic multilateralism, let alone cultural multilateralism. Yet, when President Barack Obama meets with leaders in the region it seems clear that there is linkage. In his April 2014 visits to Japan, Korea, Malaysia, and the Philippines, security and economics themes could not be easily separated (would Prime Minister Abe Shinzo make more concessions to reach an agreement on TPP in return for Obama’s acknowledgment that the Security Treaty applies to the Senkaku/ Diaoyu Islands?). Similarly, shared values underscored many of the discussions. Given stronger US security cooperation, there appears to be an understanding that states will, as in the days of the Cold War, buttress their agreements by professing shared values as well as (despite higher levels of trade with China for the most part) some economic themes. In the next five years there is no reason to think that the security situation will become less tense. The US-Japan defense guidelines under preparation in 2014 can be expected to solidify the core alliance in the emerging multilateral system, and others are likely to add their contributions to the system with no sign of any interested state losing its interest. Two question marks remain for states less enamored of the new US-led system. Those nervous that Washington will move to a new cold war mentality without consideration of China’s legitimate “core interests” may try to put the brakes on what US and Japanese leaders propose. While supporting some collective defense to limit Chinese assertiveness, they think that Beijing is amenable to persuasion through dialogue and engagement and seek to keep the burden on Washington to try harder. Indonesia and South Korea are two middle powers with this outlook—the former striving to sustain ASEAN’s centrality as in the ASEAN Regional Forum (ARF), and the latter striving to sustain the remnants of the Six-Party Talks as a multilateral framework for responding to North Korean belligerence. Will those who want to keep a balance between engaging and hedging respond both to pressure from other states and China’s further assertiveness with more pro-US policies? The other question mark is whether China will succeed in forging a multilateral system for security of its own. It has deferred to Russia in Central Asia, although the Shanghai Cooperation Organization (SCO) started with a focus on anti-terrorism and securing borders and increasingly serves as the locus of joint military exercises. China and Russia have exercised restraint in military cooperation with North Korea, given criticism of its nuclear weapons program. Yet, there are signs that Russia is growing more supportive of North Korea in 2014. While there are barriers to a northern alliance, including arms sales by Russia to states under pressure from China, we should not rule out its emergence. New North Korean provocative moves may expose a wide divide between the way countries respond—primarily as a result of different security priorities—, lead the United States and its allies to become more disillusioned with China’s role, and provide a rationale for it and Russia to oppose steps that bypass the Security Council by offering greater support to North Korea. The prospect of one multilateral security system strengthening while the other fails to take shape should be seen as temporary and even unsustainable. In the 1990s security concerns (apart from Taiwan) appeared to unite actors in the region, leading to a consensus that economic multilateralism would be the testing grounds for the foreseeable future, raising the visibility of liberal IR theories. Some argued that the faster new, multilateral institutions could be established and the quicker doubts were set aside, the more successful the outcome. The trend line has barely wavered: in the 1990s there was some movement; in the 2000s the pace intensified; and in the mid-2010s efforts to forge multilateral economic institutions are proceeding at the most feverish pace. Yet, the expected spillover is nowhere to be seen. One needs to look more closely at how things are evolving and what impact occurs in the search for both regionalism and community. Competition between different geographical frameworks of economic agreements has been endemic for a decade. Even earlier there was frequent suspicion that inclusion of some states in a regional plan came at the expense of exclusion of or opposition to the rise of others. In the Cold War era, it was common to see warnings from the Soviet Union that both US and Japanese economic arrangements with other states in Asia had ulterior motives, i.e., anti-communism. Although it appeared in the 1990s that globalization is a shared aspiration for the benefit of all and regionalism would build on this foundation, maneuvering for advantage did not wait until the FTA wars of the 2000s. China’s rise had been so consequential by 2005 that Japan led the struggle against it in ASEAN to widen the scope of economic integration from ASEAN+3, which it was now assumed that China could dominate, to ASEAN+6, especially by bringing India on board. Inclusion of Australia was significant because of its close ties to the United States, lessening any prospect for exclusive regionalism with non-economic implications. By the end of the decade, China was impatient to shift from further gradual, limited pursuit of regional institutionalization under ASEAN to a framework in which it could take the lead, while the United States had become fully engaged in the fray in support of a both an Asia-Pacific framework and a high-standard agreement that deepens economic integration. 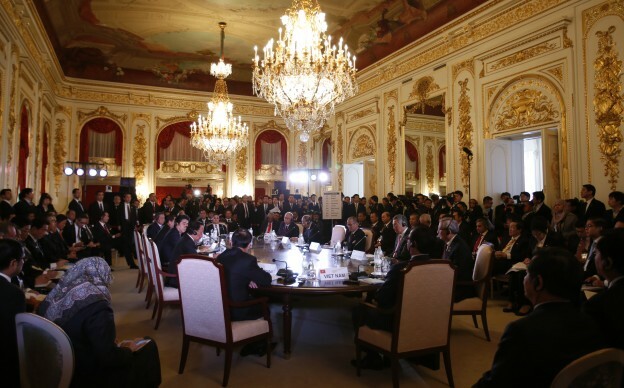 The fate of TPP, pushed by the Obama administration and increasingly the Abe cabinet as well, is likely to have considerable bearing on how multilateralism will unfold in the next period. Should it be negotiated successfully and approved by the US Congress with the likelihood that South Korea will join soon thereafter, the burden will fall on China and ASEAN to respond. Just two years ago the response anticipated from China was to oppose TPP and insist that it was part of a containment strategy, while striving to forge its own multilateral framework as it used close bilateral ties to draw some states closer. Recently, some in China have suggested that it will try to join TPP, linking entry to a new wave of economic reforms, and also play a leading role in forming other multilateral ties through RCEP (unprecedented for the total population included) and a CJK FTA (at odds with the tensions present in Northeast Asia). While a CK FTA is more likely in the short run, the existence of TPP would put considerable pressure on China to open its economy with a high-order agreement, likely to reduce the role of the state in its economy. Just as a US-led security system is enveloping the Western Pacific, TPP puts the United States, not China, on the offensive in establishing an economic framework across the Asia-Pacific. The struggle over cultural leadership proceeds less openly than the battles over military and economic multilateralism. As Zhang Xiaotong writes in his article, China has begun a new stage of multilateralism in which “common destiny” is gaining precedence over “common market.” Already in 2009, many Chinese articles were declaring that a new approach should be taken to regionalism, more assertive rather than deferential to the leadership of ASEAN and more multidimensional rather than concentrating on economic relations. Unmistakable in these writings was the emphasis on Southeast Asia as a battle ground over values, treating “universal values” as a target that China could defeat on the basis of historical cultural affinities in neighboring countries as well as its unrelenting struggle against them. The concept of “cultural security” has figured heavily in Chinese leadership discussions ever since, and the Xi Jinping administration has indicated that it will press it even more vigorously not only in domestic policy but also in foreign policy. Fronts in the “culture war” are hard to predict. Unlike Chinese clarity on Japan’s affronts over historical memory, which keep being fueled by offensive Japanese statements, when China and South Korea from 2004 and more intensely at the end of the 2000s sparred over cultural themes, few would have predicted some of the symbols that arose. Since it is China that is intent on widening the “cultural gap,” seen as useful for national identity and for disparagement of universal values, it may point to any number of possible themes or reinterpret the “China Dream” in some unexpected manner. The challenge remains to line up other countries behind it; so multilateralism can be realized in a way that justifies the theme of “common destiny.” China’s soft power strategy has not fared well in 2009-2013, as the United States has recovered from its image loss in 2008. At this time there is no obvious opening for China to turn things around: demonizing Japan is not resonating well outside of South Korea; and competing with the United States in values is failing to win a following in neighboring states with the notable exception of Russia. Talk of Silk Roads centers on infrastructure and related economic cooperation. Yet, more quickly than security and economic matters, cultural images can change, affecting multilateralism too. The tension between socialism and Confucianism has not been resolved in China. Hiding ideas rooted in China’s communist legacy under the cloak of China’s Confucian heritage allows an expansionist approach to regionalism to masquerade as a natural civilizational revival, reaching across areas once part of China’s tributary system and beyond. The core of this thinking is an unbridgeable divide between Western and Eastern civilization. If some states have been “contaminated” by Western influences or historically experienced deviant cultural forces, such as those that brought militarism to Japan, they can be faced with the stark choice of remaining under the influence of the West and its “universal values” or returning to the fold of Asian civilization under China’s leadership. Moving beyond the theme of multilateralism as inadequate, Chinese have welcomed the concept of regionalism as differentiated from the “international community” and looked toward the goal of an “Asian community,” as the right venue for its leadership aspirations. Only by adding the cultural dimension do we grasp the essence of its view of multilateralism. When Putin visited China on May 20-21, there was much speculation about how security, economics, and culture (anti-Western civilization) would combine in support of a Sino-Russian nexus for continental multilateralism in opposition to the maritime multilateral network championed by Obama in his tour of East Asia a month earlier. Would it extend to Iran, whose president was in Shanghai at the same time for a security conference with Xi and Putin as well as other Asian leaders? Instead of China’s Silk Road blueprints and Russia’s Eurasian plans competing for overlapping space, especially in Central Asia, is Silk Road Eurasianism in the offing, especially as China’s Maritime Silk Road looks doubtful? Added to the mix is the election of Narendra Modi as prime minister of India, who promises more vigorous leadership than in the past. Attention has concentrated on ASEAN as the leading institution in the quest for multilateralism, but it may be divided in a manner than renders it ineffective, especially in managing the newly intensified great power rivalries. In the three articles to follow, ASEAN’s prospects are assessed and the thinking in China on multilateralism is analyzed. A single overarching multilateral path no longer appears within reach. Despite much talk of multipolarity in recent years, this is a time for looking closely at the prospects of two such paths in opposition to each other.